Not all components are created equal. Whether you’re shopping for existing components or creating your own, there are five characteristics that all good components share. What made VB popular in 90s was the availability of rich interactive components for the desktop. We need a good standard for Web UI components and jQuery seems to be the current popular framework. LinkLog: Meaningful Innovation: Whether to Design or Evolve? Many of the interesting challenges in computer science, nanotechnology, and synthetic biology entail the construction of complex systems. As these systems transcend human comprehension, will we continue to design them or will we increasingly evolve them? As we design for evolvability, the locus of learning shifts from the artifacts themselves to the process that created them. There is no mathematical shortcut for the decomposition of a neural network or genetic program, no way to “reverse evolve” with the ease that we can reverse engineer the artifacts of purposeful design. The beauty of compounding iterative algorithms (evolution, fractals, organic growth, art) derives from their irreducibility. I think it is one of those talks I will watch a few times and think about a lot. Posted on January 12, 2011 Categories Emerging Technologies, Ideas, Creativity, Innovation2 Comments on LinkLog: Meaningful Innovation: Whether to Design or Evolve? I did not even know that there is a Journal of Information Literacy till I stumbled upon an article on assessing information literacy at university level. 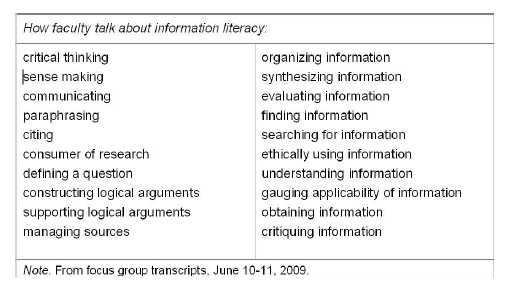 There is a nice table on the topics of information literacy and their relevance that we can all benefit from. Here’s the thing. I like to write code. I like to write code that most people take for granted. I like to write code to solve hard problems. I like to write simple programs. I like to solve the programming assignments that I set before my students. I like to discover problems to solve and then solve them with code. Sometimes, I like to make up problems just so I can write code to solve them. I wish every teacher who teaches programming thought this way. I know several successful teams where the team lead shared this passion to code. I used to do this in my first two companies. Then somewhere along the line, I decided to stop coding. I still regret getting out of touch with serious programming. Now that I am doing more teaching, I need to get back to writing code. It is one of the most invigorating experiences, I can think of. Even when your own needs have been met you can work for the betterment of others has helped me to understand that being a successful businessman can be a powerful way to contribute to society. In building a business, it’s important to remember that you aren’t just acquiring wealth for yourself, but creating value for your employees, your customers, and others whom you may never even meet. Programming: Just a means to an end? Our youth is easily influenced. Let’s remind ourselves that programming, no matter what construct you use, is just a means to an end. More often than not the code needs to get the job done and doesn’t need stupid tag lines and catch phrases like “enterprise” and “encapsulation”. Once in a while, you read a post, sit back and laugh till your stomach hurts and tears start streaming down your eyes. It may be the style of the author or it may be the content of the post. This is one of those gems. I am glad that I find them once in a while. Once in a while you watch an expert at work. I watched Sid code a small app in Django today. It was like watching some super performer. He was talking aloud for my benefit on how to design tests, how to keep refining the code. Once in a while, he would say “that works, but the code looks ugly” and would fix it instantly. I sat with him for more than three hours watching the little app take shape, right in front of my eyes. I learned a lot today. I think I learned not only how simple experts make things look. I learned a lot about fluency. I wish I had spent time sitting next to some of the super programmer friends of mine, watching them work. Overall it is a good day. I wish I had many like this. Posted on January 6, 2011 Categories Ideas, Creativity, Innovation1 Comment on Programming: Just a means to an end? A Mahout-based collaborative filtering engine takes users’ preferences for items (“tastes”) and returns estimated preferences for other items. For example, a site that sells books or CDs could easily use Mahout to figure out, from past purchase data, which CDs a customer might be interested in listening to. Mahout provides a rich set of components from which you can construct a customized recommender system from a selection of algorithms. Mahout is designed to be enterprise-ready; it’s designed for performance, scalability and flexibility. Cognizant believes the evolution of cloud solutions will take two distinct steps. The first will be a better, faster, cheaper way of delivering current IT solutions. An example today is Google Apps with corporate e-mail platforms. The second step, says Coburn, will come “when we can do new things with the cloud model at a business level. This will occur when organizations use social computing on the cloud in a business context, enabling particular platforms of collaboration around specific business problems.” Another way it will evolve is the varied adoption for public clouds versus private clouds. There are many ways to share information. Some of them may take just a few minutes. You can choose to spend as little or as much time as you want. In all the forms described above, you post and others consume (a bit of a broadcast mode). There are other methods as well which are more like interactions (asynchronous – meaning you don’t have to be at the same place at the same time). 3. A comment on a blog post – While the writing time may not be much, reading, understanding the post, understanding other comments etc. may take a while. 7. Editing/commenting on a wiki page or participating in a Debate with a tool like debate graph. There may be many others. If you think I missed an important one, please point them out.